My kids will forever share their birthday parties. We didn't plan it that way but their age gap is 2 years and 3 days. Last year was my younger son's first birthday so I wanted to do some thing special as well as appeal to both kids. I decided on a theme. 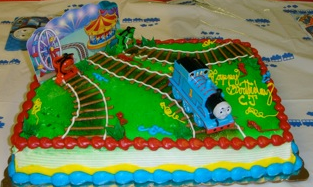 Thomas the Train goes to a carnival. It was decided by the cake we got. I was pretty proud of myself because I worked on a shoestring budget. I made train tracks and stuck them on the wall for decorations. The hubs helped make the actual trains which were way better than I could ever come up with. I hung up colored streamers and matching balloons and that completed the "I'm having a party at my house" look. For the actually party I invited guests to show up after lunch and reminded parents that it was a birthday party so to expect treats. I planned an ice cream bar with lots of toppings to add, a few snacks for the adults and of course cake. Keeping kids entertained for an hour was a task in itself. I did a classic "Pin the tail" with a Thomas theme game that I picked up from the dollar store. The kids thought it was hilarious being blind-folded and spun around. In fact my kids still like to close their eyes and spin around a year later. I also had a tin pan alley with Solo cups and soft balls. Note kids don't have the best aim so keep an eye out for a stray ball or six. This was also a favorite because kids love having things fall down. The highlight of the afternoon was a bit of a surprise for the kids as well as the adults. I put on a magic show. I practiced for at least a week and was a nervous wreck at the start of the show. I don't know what I was thinking, hosting a birthday party and being the entertainment. But the kids enjoyed every minute. One kid even said "You're amazing!" You know coming from a 4 year old, I was floored with pride. <-------- Or this. Since the kids had a ball, I don't know what I'm going to do for an encore. I have 1 month and I have no clue. I might continue to look like this. Help! Great party and looking forward to the next one. And yes those trains did look great! My hubs is pretty handy like that. Still need ideas for the next one. I love it, glad it was a success! Thanks Nadine, I need to find another idea for their birthdays that are next month. They'll be 2 and 4. If wasn't winter, I'd do something outdoors. Here is crossing my fingers to winter ends soon.